Previously, oncostatin M (OSM) has been shown to inhibit the proliferation of breast cancer cells in vitro. 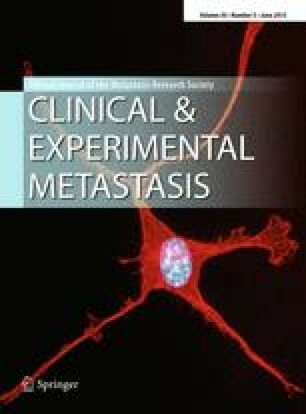 Circumstantial evidence, however, suggests that OSM could be involved in the development of a metastatic phenotype in vivo. We examined the effects of OSM on the proliferation and metastatic potential of the murine mammary carcinoma cell lines M6 (adenocarcinoma) and M6c (metastatic adenocarcinoma). OSM inhibits the proliferation of both cell lines by 43%, but also causes a loss of cell-cell and cell-substratum adhesion that culminates in cell detachment from monolayer culture. OSM treatment results in a 258% and 550% increase in the detachment of M6 and M6c, respectively, in 32 hours. This effect was abrogated by the selective Cox-2 inhibitor NS-398, and by the anti-inflammatory glucocorticoid dexamethasone. Exogenous prostaglandin E2 (PGE2) partially reverses NS-398's inhibition of OSM-induced cell detachment, indicating Cox-2 involvement. In addition, OSM induces the expression of Cox-2 mRNA, and of the 74 kDa form of Cox-2 protein. M6 and M6c cells detached by OSM are viable and will re-adhere and proliferate in the absence of OSM. OSM-detached cells (M6DET and M6cDET) were collected and maintained in culture and their invasiveness was assessed in vitro. Importantly, M6DET and M6cDET are both significantly more invasive that their respective parental cells. These data suggest that OSM could contribute to the development of a metastatic phenotype in vivo, which would render OSM unsuitable as a cancer therapy and suggest that OSM itself is a potential therapeutic target.